Please note: this Trek Checkpoint ALR 4 WSD is available for in store collection only. This is a global policy of Trek Bicycles. If you would like to purchase this model we recommend using our Click & Collect payment method to reserve your bike online. 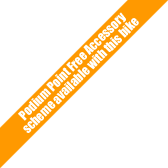 This Trek Checkpoint ALR 4 WSD 2018 is available with our legendary Podium Point free accessory scheme.